A fief ( /fiːf/ ; Latin : feudum) was the central element of feudalism. It consisted of heritable property or rights granted by an overlord to a vassal who held it in fealty (or "in fee") in return for a form of feudal allegiance and service, usually given by the personal ceremonies of homage and fealty. The fees were often lands or revenue-producing real property held in feudal land tenure: these are typically known as fiefs or fiefdoms. However, not only land but anything of value could be held in fee, including governmental office, rights of exploitation such as hunting or fishing, monopolies in trade, and tax farms. Marc Léopold Benjamin Bloch was a French historian. A founding member of the Annales School of French social history, he specialised in the field of medieval history and published widely on Medieval France over the course of his career. As an academic, he worked at the University of Strasbourg, the University of Paris, and the University of Montpellier. Rt. Rev William Stubbs HFRSE was an English historian and Anglican bishop. He was Regius Professor of Modern History at the University of Oxford between 1866 and 1884. He was Bishop of Chester from 1884 to 1889 and Bishop of Oxford from 1889 to 1901. 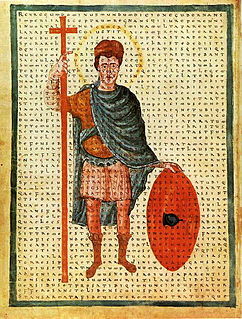 Vita Hludovici or Vita Hludovici Imperatoris is an anonymous biography of Louis the Pious, Holy Roman Emperor and King of the Franks from AD 814 to 840. Languedoc is a former province of France. Its territory is now contained in the modern-day region of Occitanie in the south of France. Its capital city was Toulouse. It had an area of approximately 27,376 square kilometers. Fraxinet or Fraxinetum was the site of a 10th-century fortress established by Muslims at modern La Garde-Freinet, near Saint-Tropez, in Provence. The modern Massif des Maures takes its name from the Muslims of Fraxinet. A manor in English law is an estate in land to which is incident the right to hold a court termed court baron, that is to say a manorial court. The proper unit of tenure under the feudal system is the fee, on which the manor became established through the process of time, akin to the modern establishment of a "business" upon a freehold site. The manor is nevertheless often described as the basic feudal unit of tenure and is historically connected with the territorial divisions of the march, county, hundred, parish and township. In English usage, the word "fee" is first attested around 1250–1300 (Middle English); the word fief from around 1605–15. In French, the term fief is found from the middle of the 13th century (Old French), derived from the 11th-century terms feu, fie. The odd appearance of the second f in the form fief may be due to influence from the verb fiever 'to grant in fee'. 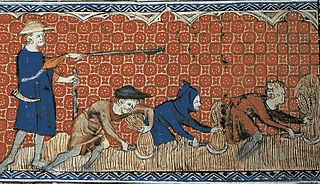 In French, one also finds "seigneurie" (land and rights possessed by a "seigneur" or "lord", 12th-century), which gives rise to the expression "seigneurial system" to describe feudalism. By the middle of the 10th century, fee had largely become hereditary. The eldest son of a deceased vassal would inherit, but first he had to do homage and fealty to the lord and pay a "relief" for the land (a monetary recognition of the lord's continuing proprietary rights over the property). A list of several hundred such fees held in chief between 1198 and 1292, along with their holders' names and form of tenure, was published in three volumes between 1920 and 1931 and is known as The Book of Fees ; it was developed from the 1302 Testa de Nevill . 1 2 3 4 5 6 7 8 9 Meir Lubetski (ed.). Boundaries of the ancient Near Eastern world: a tribute to Cyrus H. Gordon. "Notices on Pe'ah, Fay' and Feudum" by Alauddin Samarrai. Pg. 248-250 Archived 2015-10-29 at the Wayback Machine , Continuum International Publishing Group, 1998. 1 2 3 Marc Bloch. Feudal Society, Vol. 1, 1964. pp.165-66. ↑ Archibald R. Lewis. The Development of Southern French and Catalan Society 718-1050, 1965, pp. 76-77. 1 2 Alauddin Samarrai. "The term 'fief': A possible Arabic origin", Studies in Medieval Culture, 4.1 (1973), pp. 78-82. ↑ "fee, n.2." OED Online. Oxford University Press, June 2017. Web. 18 August 2017. 1 2 Cantor (1993), pp. 198-199. 1 2 Cantor (1993), p. 200. 1 2 Abels, Richard. "Feudalism". United States Naval Academy. Archived from the original on 2010-03-27. Retrieved 2010-08-27. In feudal Anglo-Norman England and Ireland, a knight's fee was a unit measure of land deemed sufficient to support a knight. Of necessity, it would not only provide sustenance for himself, his family, esquires and servants, but also the means to furnish himself and his retinue with horses and armour to fight for his overlord in battle. It was effectively the size of a fee sufficient to support one knight in the ongoing performance of his feudal duties (knight-service). A knight's fee cannot be stated as a standard number of acres as the required acreage to produce a given crop or revenue would vary depending on many factors, including its location, the richness of its soil and the local climate, as well as the presence of other exploitable resources such as fish-weirs, quarries of rock or mines of minerals. If a knight's fee is deemed co-terminous with a manor, an average size would be between 1,000 and 5,000 acres, of which much in early times was still "waste", forest and uncultivated moorland. Seisin denotes the legal possession of a feudal fiefdom or fee, that is to say an estate in land. It was used in the form of "the son and heir of X has obtained seisin of his inheritance", and thus is effectively a term concerned with conveyancing in the feudal era. The person holding such estate is said to be "seized of it", a phrase which commonly appears in inquisitions post mortem. The monarch alone "owned" all the land of England by his allodial right and all his subjects were merely his tenants under various contracts of feudal tenure. Knight-service was a form of feudal land tenure under which a knight held a fief or estate of land termed a knight's fee from an overlord conditional on him as tenant performing military service for his overlord. An overlord in the English feudal system was a lord of a manor who had subinfeudated a particular manor, estate or fee, to a tenant. The tenant thenceforth owed to the overlord one of a variety of services, usually military service or serjeanty, depending on which form of tenure the estate was held under. The highest overlord of all, or paramount lord, was the monarch, who due to his ancestor William the Conqueror's personal conquest of the Kingdom of England, owned by inheritance from him all the land in England under allodial title and had no superior overlord, "holding from God and his sword", although certain monarchs, notably King John (1199-1216) purported to grant the Kingdom of England to the Pope, who would thus have become overlord to English monarchs. A paramount lord may thus be seen to occupy the apex of the feudal pyramid, or the root of the feudal tree, and such allodial title is also termed "radical title", "ultimate title" and "final title". William the Conqueror immediately set about granting tenancies on his newly won lands, in accordance with feudal principles. The monarch's immediate tenants were the tenants-in-chief, usually military magnates, who held the highest status in feudal society below the monarch. The tenants-in-chief usually held multiple manors or other estates from the monarch, often as feudal barons who owed their royal overlord an enhanced and onerous form of military service, and subinfeudated most to tenants, generally their own knights or military followers, keeping only a few in demesne. This created a mesne lord - tenant relationship. The knights in turn subinfeudated to their own tenants, creating a further subsidiary mesne lord - tenant relationship. Over the centuries for any single estate the process was in practice repeated numerous times. 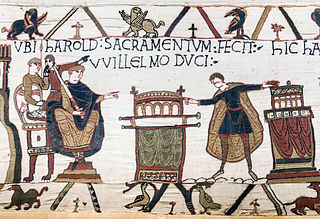 In early times following the Norman Conquest of 1066 and the establishment of feudalism, land was usually transferred by subinfeudation, rarely by alienation, which latter in the case of tenants-in-chief required royal licence, and the holder of an estate at any particular time, in order to gain secure tenure, and if challenged by another claimant, needed to prove "devolution of title" evidenced by legal deeds or muniments back up the chain of subinfeudations to a holder whose title was beyond doubt, for example one who had received the estate as a grant by royal charter witnessed and sealed by substantial persons. Although feudal land tenure in England was abolished by the Tenures Abolition Act 1660, in modern English conveyancing law the need to prove devolution of title persisted until recent times, due to a "legal fiction" that all land titles were held by the monarch's subjects as a result of a royal grant. Proving devolution of title is no longer necessary since the creation of the land registry and the requirement to compulsorily register all land transactions on this governmental record, which registration provides a virtually unchallengeable and perfectly secure title of ownership. A feudal baron is a vassal holding a heritable fief called a barony, comprising a specific portion of land, granted by an overlord in return for allegiance and service. Following the end of European feudalism, feudal baronies have largely been superseded by baronies held as a rank of nobility, without any attachment to a fief. However, in Scotland, the feudal dignity of baron remains in existence, and may be bought and sold independently of the land to which is was formerly attached. The precarium —or precaria in the feminine form—is a form of land tenure in which a petitioner (grantee) receives a property for a specific amount of time without any change of ownership. The precarium is thus a free gift made on request and can be revoked. The grantor can reclaim the land and evict the grantee at any time, and the grantee's hold on the land is said to be "precarious". The precarium arose in the late Roman Empire. In the Middle Ages it became a legal fiction, and the two parties usually signed a contract specifying the rent or services owed by the petitioner. Some precaria eventually became hereditary fiefs. In the Merovingian period the feminine form became common, but in the eighth century the term beneficium began to replace precarium, although the institutions were practically identical. An allod, also allodial land or allodium, refers, in the law of the Middle Ages and early Modern Period and especially within the Holy Roman Empire, to a freehold estate in land over which the allodial landowner (allodiary) had full ownership and right of alienation. In the feudal system of the European Middle Ages, an ecclesiastical fief, held from the Catholic Church, followed all the laws laid down for temporal fiefs. The suzerain, e.g. bishop, abbot, or other possessor, granted an estate in perpetuity to a person, who thereby became his vassal. Even before the Norman Conquest, there was a strong tradition of landholding in Anglo-Saxon law. When William the Conqueror asserted sovereignty over England in 1066, he confiscated the property of the recalcitrant English landowners. Over the next dozen years, he granted land to his lords and to the dispossessed Englishmen, or affirmed their existing land holdings, in exchange for fealty and promises of military and other services. At the time of the Domesday Book, all land in England was held by someone, and from that time there has been no allodial land in England. In order to legitimise the notion of the Crown's paramount lordship, a legal fiction - that all land titles were held by the King's subjects as a result of a royal grant - was adopted. Feudal relief was a one-off "fine" or form of taxation payable to an overlord by the heir of a feudal tenant to license him to take possession of his fief, i.e. an estate-in-land, by inheritance. It is comparable to a death duty or inheritance tax. The Book of Fees is the colloquial title of a modern edition, transcript, rearrangement and enhancement of the mediaeval Liber Feodorum, being a listing of feudal landholdings or "fees/fiefs", compiled in about 1302, but from earlier records, for the use of the English Exchequer. Originally in two volumes of parchment, the Liber Feodorum is a collection of about 500 written brief notes made between 1198 and 1292 concerning fiefs held in capite or in-chief, that is to say directly from the Crown. From an early date, the book comprising these volumes has been known informally as the Testa de Nevill, supposedly after an image on the cover of the volume of one of its two major source collections. The modern standard edition, known colloquially as "The Book of Fees" whose three volumes were published between 1920 and 1931, improves on two earlier 19th-century efforts at publishing a comprehensive and reliable modern edition of all these mediaeval records of fees. The nomenclature Book of Fees is that generally used in academic citations by modern scholars to refer to this 20th-century modern published edition of the ancient collected documents. Feudalism in the Holy Roman Empire was a politico-economic system of relationships between liege lords and enfeoffed vassals that formed the basis of the social structure within the Holy Roman Empire during the High Middle Ages. In Germany the system is variously referred to Lehnswesen, Feudalwesen or Benefizialwesen. Wikisource has the text of the 1911 Encyclopædia Britannica article Fief . Reynolds, Susan (1996). Fiefs and Vassals: The Medieval Evidence Reinterpreted. Clarendon Press. ISBN 9780198206484 . Retrieved 12 September 2016.